All of our surgical specialties deal with patients with cancer. Members of our Department of Surgery have an impressive level of research productivity in this area. In the past five years, our faculty had close to 500 peer reviewed articles published on cancer research. This included publications in the highest ranked journals, such as Nature and the New England Journal of Medicine. The University of Toronto is embarking on a process of undergraduate curriculum renewal. During the SARS outbreak, there was remarkable variation between surgery units in our university affiliated hospitals. The Institute of Medicine estimates that there are 50 to 99 thousand deaths per year related to medical error in the US. Catheter based endovascular interventions may reduce complications and offer advantages over open techniques for traumatic rupture of the aorta. Where does creativity exist in medicine? The most riveting and moving University Grand Rounds of the year was given by a patient. 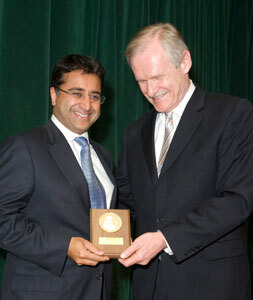 Dimitri Anastakis (PlasSurg) is the recipient of the 2008 Canadian Association for Medical Education Certificate of Merit Award. The aim of this award is to promote medical education in Canadian medical schools and to recognize and reward faculty’s commitment to medical education. Michael Cusimano (NeurSurg) is this year’s winner of the John Provan Award given by the Canadian Association of Surgical Chairs. The award recognizes Dr. Cusimano’s long standing contributions to the field of education.